Chang’e 4’s historic mission across the dark side of the moon continues. The Chinese spacecraft, which made history with the first soft landing on the moon’s lesser-known far side, has begun exploring the rocky terrain in earnest. The China National Space Administration (CNSA) has begun releasing pictures of the Chang’e 4’s rover on its journey. Chang’e 4 is exploring the South Pole-Aitken basin (SPA), one of the largest impact craters in the solar system. It’s specifically researching an impact crater within the SPA known as the Von Kármán crater, which has historic value for the CNSA as well. The crater is named after Hungarian-American physicist Theodore Von Kármán, who acted as a Ph.D. advisor for the man widely seen as the founder of the modern Chinese space program, Qian Xussen. Beyond symbolism, the Von Kármán crater has the potential to answer questions about the moon’s “internal structure and thermal evolution,” according to a recent academic overview. 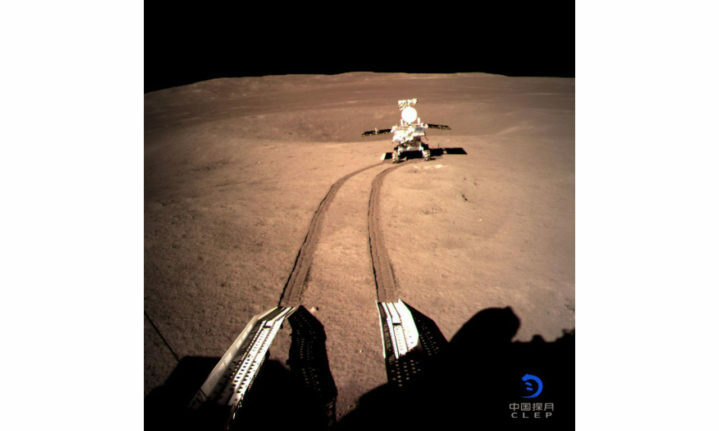 The Chang’e 4 mission comprises two parts—the lander and the rover. With the rover beginning its exploration, the Chinese government announced its name: Yuta 2, the follow-up to the original Yuta rover which began exploring the moon in 2013. Originally scheduled for a three-month stint, the first Yuta ended up exploring the lunar surface for 973 days. It’s a success story the CNSA would love to repeat. Yuta 2, whose name means “Jade Rabbit,” is the first rover exploring the far side of the moon, carrying with it a tin holding silkworm eggs as well as seeds of a variety of plant species, including potatoes. As Yuta 2 moves across the moon, scientists will monitor how these seeds grow in a lunar environment. One of the big challenges that has prevented a rover from exploring the far side before is the difficulty of making contact with Earth. Yuta 2 and Chang’e 4 have solved the problem with a bridge relay satellite that’s been orbiting the moon since June 2018. Known as Queqiao, it has been keeping an eye on the pair as they explore. With any luck, it will keep the photos coming in the days and months ahead.